When I decided to try out natural deodorants I sampled a few different brands before landing on local company The Natural Deo Co. Their deodorant creams are by far my favourite (particularly the baking soda-free Gentle formula Vanilla & Manuka) and I would highly recommend trying them out for yourself. I've been using them almost exclusively now for at least a year and a half and I can't ever imagine going back to a traditional deodorant. If you're keen to make the switch I'd recommend reading up on the 'detox period' beforehand and stick with it if you can. The first time I tried out natural deodorants I had no idea this was a thing and gave up after a few days thinking it would never work for me - I was very wrong! I stumbled across Read The Label whilst exploring Camden with Ria earlier in the year and ended up heading home with a shampoo bar, neem bar and body butter. The first thing to note about this product is that it smells incredible, the organic raw cocoa butter definitely shines through. Also made with mango butter and a selection of oils it has a super smooth whipped texture that's non-greasy and is a great moisturiser. As you only need to use a small amount at £7.50 it's really affordable too! If you caught my post on non-toxic sunscreens you'll already know this is my go-to daily facial sunscreen and I've been using it regularly now for almost a year. The smooth formula isn't too heavy on the skin and it doesn't cause me any breakouts, plus it's completely unscented which is a bonus for those of us who don't like the smell of sunscreens! 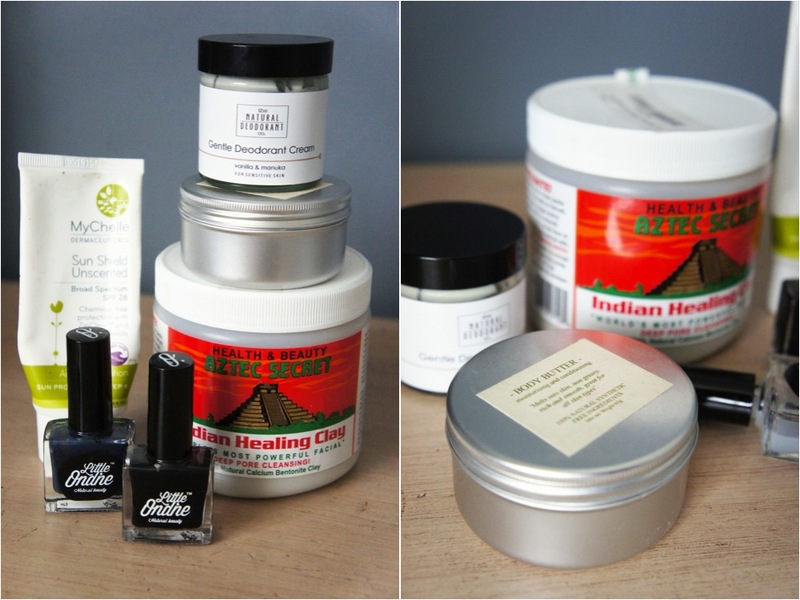 Whilst still blogging at e-elise etc I began my search for a non (or less) toxic nail polish brand after becoming fed up with the headaches caused by polish fumes and the stinging of my eczema every time I used a polish remover. Of course, I had to try out a few different brands and formulas before finally finding one that ticked all of the boxes but Little Ondine is truly the perfect polish for me. It's non-toxic, unscented and peels off meaning no need for stinky polish removers, plus for me the wear is just as good, if not better than other polishes. My final pick is bentonite clay which can be used for a variety of things including my favourite use; face masks. Although the packaging suggests mixing with apple cider vinegar my skin isn't a huge fan of this so usually I like to mix it with a little activated charcoal and water. I use the popular Aztec Secret brand as it's easy to get hold of but as there are no other ingredients any 100% bentonite clay should do the same job - just be sure not to use any metal spoons/bowls with the clay. What are your must-try natural products?